I don’t write too often about the Navy even though I spent six years of my life wearing the uniform but this story is so ridiculous that I can’t let it pass without comment. It concerns the contracting and construction of the aircraft carrier Gerald R. Ford. What you learn from reading the story is that the newest carrier in the fleet can’t launch aircraft, can’t safely land them, and can’t equip them with weapons; other than that, it’s a fine vessel. 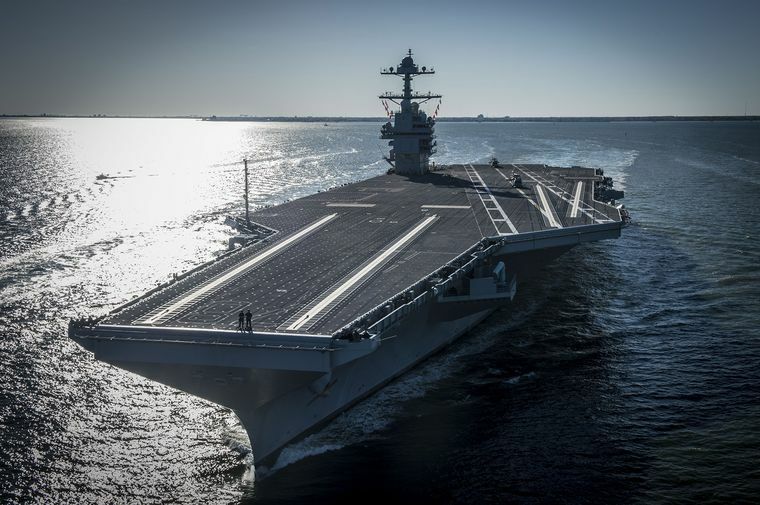 The elevator system is “just another example of the Navy pushing technology risk into design and construction — without fully demonstrating it,” said Shelby Oakley, a director with the U.S. Government Accountability Office who monitors Navy shipbuilding. In the above we learn two more facts, this ship design was the responsibility of Presidents not named Trump since construction takes years to accomplish and second and more importantly, the ship relies on untested technology. Sorry folks but that is not how the military; especially, the Navy did things in my era. The Navy is in the unique position of traveling wherever they are needed without a traditional supply chain which for them can be stretched or even nonexistent for long periods of time. This forces them to be self-reliant and needing to improvise because parts could be thousands of miles away. Traditionally, they have used lower and more proven tech. I was in the Naval Nuclear Power Program and the control systems that we used on the reactors were purposely not based on solid-state electronics. If you can believe it, there were zero transistors on any reactor protection systems! Hyman Rickover, who started the Navy’s nuclear powered ship program, did not believe in implementing this technology. I think it was both a supply chain issue and one to prevent propulsion from being crippled by EMP. Instead we used magamps. Magamps are something that was so old-school in the 1980’s that my friend with an electrical engineering degree had never even hear of them in any of his classes. The only propulsion supply issue that we ever experienced was getting a replacement fuse for the reactor protection ABT (Automatic Bus Transfer). Reactor protection systems had two independent supplies of electrical power available and this switch was able to go from one to the other fast enough not to scram the reactor. The fuse for this switch blew during a routine test. It took ten days to get a replacement. The fuse was about eight inches long and over 3/8th of an inch in diameter; it’s not your typical off the shelf part from Ace Hardware. Using unproven designs for the catapult system and weapons elevators is not something they should be deploying for all four Ford class carriers currently authorized for construction. As a result, the Navy owns a warship cruise ship ready to go anywhere in the world that can’t conduct war and has a capacity of 10,000 passengers. On many levels, the Ford sounds like the Democrat military model to me. This is another in a long series of failures by the Navy in recent years. They can’t build ships that work and can’t drive ‘em once they set sail.